West Ham United complete the signing of Argentinian ace striker. West Ham United have completed the transfer of the Argentinian striker Jonathan Calleri according to the Mirror. 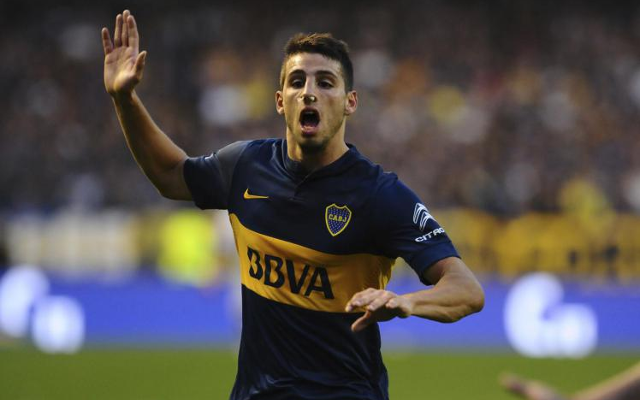 Per-the-source, the Hammers have agreed to sign Calleri on a season-long loan from the Uruguayan giants Deportivo Maldonado. The 22-year-old was granted international clearance and began training with wih his new teammates yesterday afternoon. “I am very happy to have signed for West Ham,” Calleri told West Ham’s website. “This represents a fantastic new challenge for me and I am really looking forward to it. Maldonado previously signed Calleri from the Argentinian club Boca Juniors back in January however, the striker was sent on a six-month loan to Sao Paulo before playing a single game. Calleri was a hit at the Brazilian club scoring 12 goals in 17 appearances. The 22-year-old becomes the sixth Argentine to play for West Ham after Lionel Scaloni, Javier Mascherano, Carlos Tevez, Mauro Zarate and Manuel Lanzini. West Ham take on the Romanian side Astra Giurgiu in the Europa League qualification round on Thursday. Slaven Bilic’s side host Bournemouth in the Premier League this weekend.